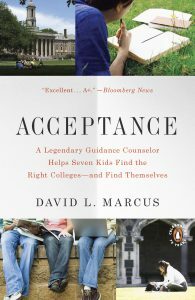 Wondering what happened to the students of “Acceptance”? Lee laughed recently as he recalled his desire to go to Deep Springs, an all-male college on a ranch in California. He’d ended up at New York University, and he had no doubt he’d gone to the right place. He also felt he’d sometimes come off as arrogant when he was at high school. Chelsea is spending the summer teaching sailing after a fulfilling first year at the College of Charleston. She has no regrets about turning down NYU and Skidmore. Jeff returned home invigorated after freshman year at West Virginia University, and hopes to beecome the manager of the basketball coach. Allyson Frankel found her place at the University of Michigan, and was glad for a change from small-town Oyster Bay. While Riana excelled in classes at City College of New York, she has been feeling the pull of the unknown. She sometimes thinks about transferring out of New York, to another state. Layla Eran applied to twenty-eight programs, but ended up happily at one of those closest to home: Barnard College. She was certain she wanted to become a psychiatrist, but now she’s considering other options. Nathaniel reports that he’s made friends and found challenging courses at Worcester Polytechnic. The Cornell wait list didn’t work out, but he doesn’t mind. After spending his life in the New York suburbs, Andreas needed some time to adjust to Georgia Tech, but he did well in classes and liked the chance to start over. After winning the Horatio Alger scholarship, a national award, Curtis had high hopes for the University of Miami. But he left after one semester. Too many of his classmates, he said, were simply interested in partying. Kasper, like Lee Kim, found NYU’s intellectual feeling and fast pace a perfect. Jeff’s girlfriend, Jenna, needed some time to settle into Barnard College. She hopes to become a doctor, and to work with diabetic children. As an aspiring actress, Dominique found plenty of competition at Emerson College in Boston. By the spring of her first year, she had appeared in several student productions and she liked the school. After finishing his first crew season at Dartmouth College, Colin said he couldn’t picture himself anywhere else – not even Yale, which his older brother attends. Colin added that while he liked Oyster Bay High School, he finds college much more interesting.